As hard as it was to keep up with this challenge, I’m a little sorry to see Inktober go. It’s made me hone my skills, challenge my abilities, discipline myself, and put my neck out a little as I delved into what I wanted to do, what I hoped to do, and what I never dreamed of doing. 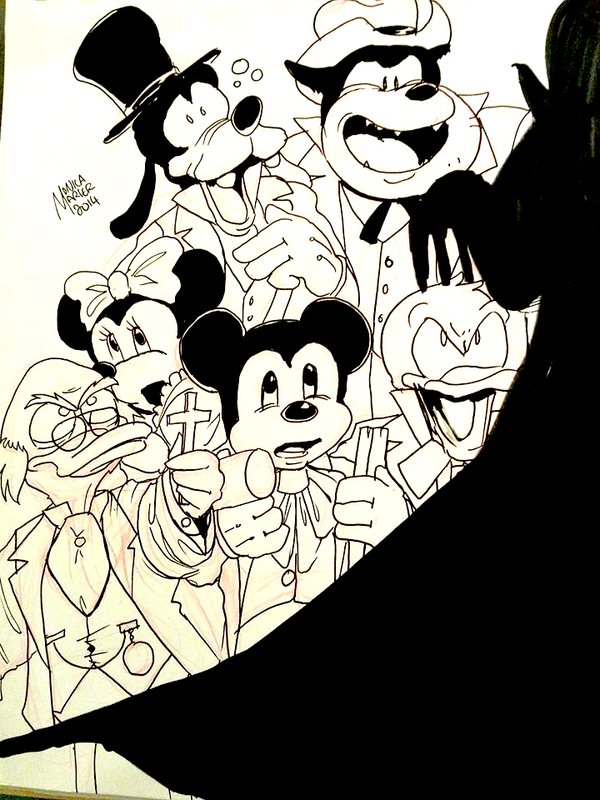 MICKEY MOUSE in DRACULA by Monica Marier, Fan piece only, not for sale. This brain child came out a while ago while I was reading Dracula and for some reason Van Helsing (who up to now was always Mel Brooks in my head) kept sounding like Ludwig Von Drake. It wouldn’t stop, either, the whole time my head kept ringing with voice of the adorable duck professor (Don’t cha know). My thoughts began to spiral out of control as a larger cast of characters began to build in my head in a Rated G version of the classic monster movie: Micky and Minnie as the Harkers, Donald and Daisy as Arthur and the unfortunate Lucy. Then Goofy and Pete cast themselves as Doctor Seward and QUincy Morris respectively. I even finally got around to a Renfield (Mr. Toad). But Dracula refused to be cast. He was just… Dracula… a cartoon version of the dark Bela Lugosi, or else in shadow like some Ghost of Christmas Future. Elegant and otherworldly and utterly not of the friendly world of Mickey Mouse. So, that concludes this year’s Inktober. I’ll definitely do this again next year! Hope you enjoyed it as much as I did. Good luck to all the nanowrimo people tomorrow as we line up for the starting pistol.